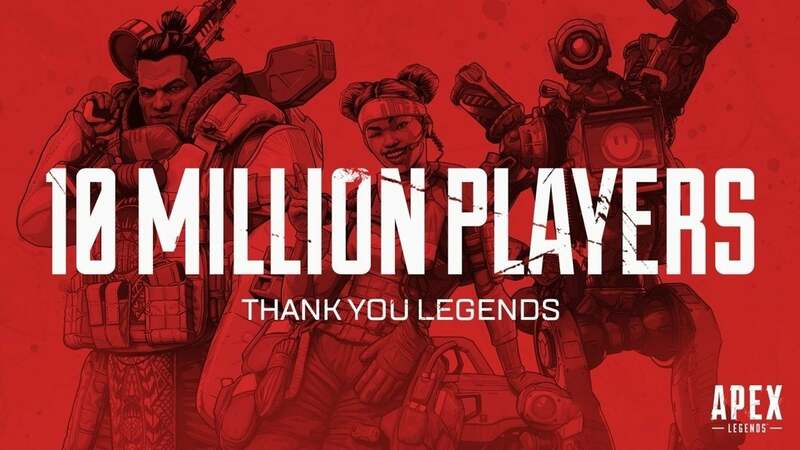 Apex Legends hit over 2.5 million players within the first 24 hours of launch and so far, the fan reception has been wildly positive. The latest battle royale game takes place in the Titanfall universe, and while it may not be the Titanfall 3 we were hoping for -- it's still a phenomenal free-to-play experience which makes it even more exciting to report that the newest online game has hit over 10 million players! The team over at Respawn took to the EA website to give a message of thanks to fans that have been giving their latest IP a shot. "This has been a truly incredible journey," said Respawn's Vince Zampella. "We tested and tweaked. We argued and agreed. We got to a point where we felt some magic. We knew it would be risky to take the franchise in this direction, to go free to play, and do a surprise launch. But we fell in love with Apex Legends and wanted, needed, other people to play it too." Zampella added, "We hoped you’d love it as much as us, but never in our wildest dreams could we have expected the outpouring of support and positivity we’ve seen. From all of us at Respawn, thank you for giving us and Apex Legends a chance. Thank you for joining us on this journey. This is just the beginning! We have so much more in store for you this year." If you haven't tried out the title for yourself, it's definitely a title worth giving a shot even if battle royale isn't necessarily your thing. It's free, so you have nothing to lose there, and it has something unique to set it apart from other Battle Royale titles out there currently on the market.